The Lutron CA-3PS is a 3-Way 15A Switch available in a variety of finishes. More about this light control: 15Amp 3-Way 120/277V Switch. This light fixture is from the Claro Collection and is UL Indoor Approved. To view further details of this Lutron Device, see Lighting Fixture Features above. 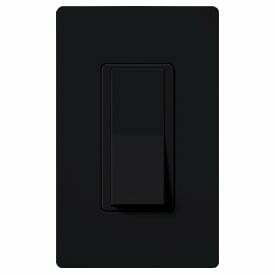 Lutron CA-3PS-BL Claro-Black collection 15Amp Switch in Black. This item is 4.69"H x 2.94"W. The voltage is 120 volts.